Based in Wallasey Village on the stunning Wirral peninsula, in the Northwest of England. Natalie’s Cakes & Bakes provide home baked cakes for all occasions from christenings to birthdays, engagements to weddings. Delicious and beautifully decorated cakes designed to your specification. I pride myself on cakes that not only look good but taste great too! 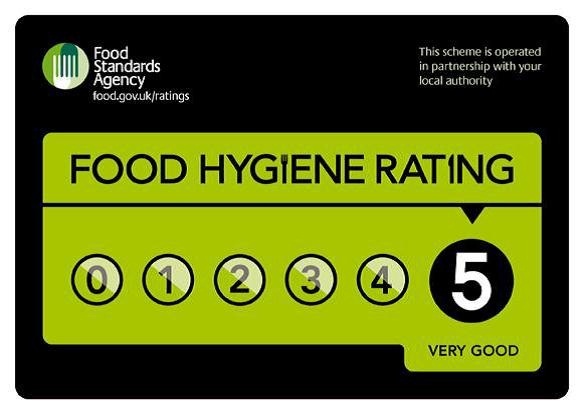 Natalie’s Cakes & Bakes holds a 5 star Food Hygiene Rating from the local authority. Hi i am interested in a cupcake bouquets for my nans funeral on Friday 29th jan a mix of lilac and cream please? Hi Natalie, hope you’re well 🙂 do you have any availability to do a sponge cake with buttercream for the 28th next week please? Thanks! Hi Natalie, waiting on a reply to my Facebook enquiry. Just worried you haven’t picked it up with the automated reply, thanks x.
Hi Natalie I am looking for a bing cake for my boys birthday can you help? Hi my friend jenny brooks put me in contact with you- I am looking for a christening cake for 17 July and wondered what your costs are for a 1 tier and a two tier cake. For approx 50 people. The girls that are getting christened are actually 3 1/2 so it won’t be the usual type of baby christening cake more like a girlie cake. If you could pls give me costs then that would be fab thanks . Hi I am looking for a Ariel Mermaid birthday cake for a 3 yr old. Approx 20 servings minimum. 1 tier would suffice. HI Hayley, single tier cakes start at £45 for an 8 inch. At the moment I am fully booked until November. Hi this short notice but I was wondering if you could do 30 cat cupcakes for weds? Hi Helen, I’m sorry I’m afraid I am fully booked until November. Hi Sharon, What date do you need the cake for? Hi Natalie. You might remember me, we met at Royden Park with kids over xmas. I’m Rachael’s friend. She told me about your fabulous cakes, they look fab on this page. I’m after a 60th birthday cake but it’s for Saturday 4th Feb so not much time. Is there any chance you could fit me in?